Can the Selphy CP530 printer be used to print heat transfer paper for mug printing? You'll need to refer to your Canon Selphy CP530 printer manual for printer specifications and a list of supported functions. The Selphy CP530 is a dye sublimation printer although we only supply the standard Canon CP530 ink cartridges which are normally only used to make photo prints. We would advise you to check the manual or contact Canon directly to see if any specialist type of ink is required for mug printing as we can't guarantee that our cartridges support this method of printing. Which Canon printers use the five cartridge system? The Canon Selphy CP530 is a compact photo printer that uses a dye-sublimation thermal transfer printing system which requires a single tri-colour ink cassette. The Selphy CP530 ink ribbons are only available in photo packs which contain these ink cassettes as well as photo paper for the machine. This printer doesn't use a five cartridge system. However, there are other Canon models from the Pixma series that do use a five cartridge system although there are many different models which require different number cartridges so we're unable to give specific details on any particular model. If you use the menus on our website to find your printer by name then this should bring up a full list of cartridges that are compatible with your specific model number. I'm loking for a cartridge refill for the Canon Selphy CP530 photo printer. I've have found matches but am not 100% certain what is included in the packs. I'm hoping to buy the cartridge plus paper as a package. If something is described as a 'photo package' on your website, would this be a cartridge and paper or just the cartridge alone? A 'photo pack' always refers to a package containing ink and paper. All of the items we supply for the Selphy CP530 contain at least one ink cartridge and some paper. The difference between the packs is the amount of ink you get and also the amount / size of paper can vary. By clicking on the item you wish to buy you can read more in our product description and specification. Please ensure that you are ordering the correct size paper / cartridges as we are unable to accept items back which have been ordered in error and have been opened. If you require any further assistance please contact our friendly freephone support team. It's a doddle to get crisp, clear printouts with the Canon CP-530 printer. After some time your Canon CP530 will run out of printer ink, and then you'll quickly learn that fresh Canon CP530 ink is often really pricey. Thank goodness you don't have to be concerned about shelling out the steep asking prices you'll find on the high street because right here at Cartridge Save you can find all the Canon CP 530 cartridges you want at ultra competitive prices. Spend less money on your ink by ordering with Cartridge Save! Why pay more to get the CP-530 original cartridge or CP530 compatible ink on the high street when it's easy to save a load of cash ordering with Cartridge Save. Get one hundred per cent peace of mind by ordering your Selphy CP530 ink cartridges from us because every one is covered by a rock solid money back guarantee. Take into consideration that every single order also comes with free delivery, normally delivered to your address the next business day! Photo lovers and scrapbook makers should be armed with the compact and tidy Canon Selphy CP530. This printer is made specifically for photo printing, so you expect high-quality photos that are durable and that can last for years. It offers borderless printing and direct printing – no need for a PC to work. The only trouble is that it lacks an LCD display and memory card slots. The Canon Selphy CP530 is a minimalist device that weighs 0.915 kg and has dimensions of 176 x 63, 127 making it easy to fit in your luggage for vacations or store on any small desk in the house or office. The Canon CP530 has a maximum resolution of 300 x 300 dpi and it can print a maximum of A6 size. 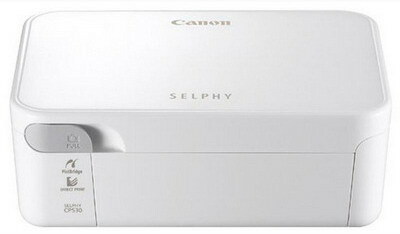 Users will not be disappointed with the quality of prints of the Canon Selphy CP530. Photos are of high-quality and last for years. Printing without a PC is easy, as the Canon Selphy CP530 supports all Canon printers with the USB port. For other digital cameras, direct-printing can be done with the PictBridge feature. The Selphy CP530 supports both Macintosh and Windows operating systems. With its small size, the Canon Selphy CP530 has limited printing capacity. It lacks cards slots and an LCD screen for direct printing from memory cards.